March is a tough time of year here in the mighty northern plains. The snow has only started to melt and big snowstorms keep heading our way only to veer left or right - the ides of March. We'll get a warm day, then a cold one, then a cold snap for a few days...and the sky is cloudy with lots of snow evaporation and precipitation. The cold, crisp sunny days of February are gone and we are deep in the soggy mess that is March. The dogs keep tracking in mud from the backyard and have learned to lift their feet for cleaning as they go in the sliding door. 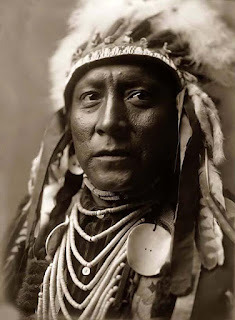 In the mid-late 1800's, Dakota Indians in this area entered 8 week near-starvation periods in March and April - game was scarce after the long, hard winter, the ice could not support their weight to fish and buffalo did not start their migration until well after the snow melt. Dakota did not store as much food in the days after the horse became a mainstay in the culture. Previously, per the ancesters, Dakota's were experts at food storage and living well off food stores during the long winter. Horses made indians more dependent on game and hunting that brought them greater distances from camp. About 80 years ago, Grandma MaryAnn Workman's pantry shelves would be looking lighter and seeds would be started in the greenhouse in the coming weeks. There is a joy of winter here in minnesota - it's just the "going into" and "coming out of" our winter phase that is somewhat difficult.